100% superfine merino wool, crochet. I just love this vintage crochet fan pattern. I first tried it on a little pram snuggle blanket, after discovering the pattern on a sweet blog I frequent, called Meet me at Mikes. Pip (from Meet me at Mikes) is quite the crafty legend around this part of the world, and her blog is a lovely inspiring place to visit. Anyway after making Gelato Fans I decided I wanted to try the pattern for a scarf. I made the scarf in two halves that I joined in the middle, so the pattern is the same at each end of the scarf. 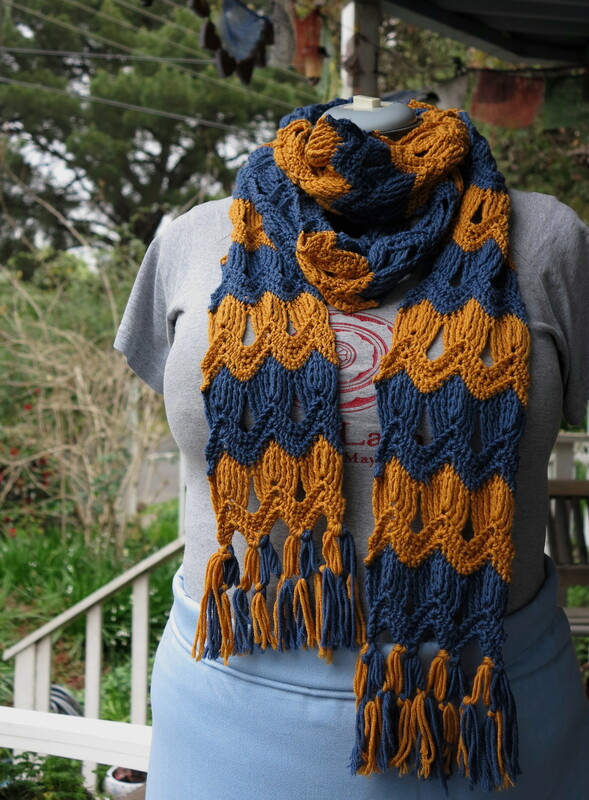 I think the pattern ended up working quite well for a scarf and love the way the mustard/pumpkin colour contrasts with the rich denim blue – a good jeans scarf I’m thinking. The yarn is luxuriously soft and was a delight to work with – I never knew wool could be so soft and fluffy. I’ve made this scarf for the “made it” challenge on ‘Woolhogs’ blog. I love the idea of supporting another newish blog, especially when the lovely Maryanne is making such admirable efforts in getting together crafty folk from blogs all over the world. Well done Woolhogs – it’s a fab idea! Wishing you a happy crafty week ahead. This entry was posted in crochet and tagged 100% wool, crochet, crochet pattern, made it, merino, scarf, superfine, vintage crochet pattern. Bookmark the permalink. And thanks for creating the Made It challenge, it really is a terrific idea!